This is a fun breakfast meal to make for kids! The egg mixture is baked in a muffin pan so they can eat it with their hands like a muffin. They will love the cheesy macaroni center. Preheat oven to 375 degrees. Spray muffin pan with non-stick cooking spray. Add elbows pasta to medium uncovered pot with boiling water. Add a pinch of salt and boil pasta stirring occasionally until al dente, about 7 minutes. Remove from heat and drain well. In a medium bowl, whisk eggs, salt, milk, and cheese. Stir in pasta. Pour egg mixture into muffin pan using ¼ cup measuring cup. 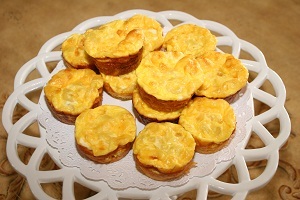 Bake in the center of the oven until cheese starts to lightly brown and eggs are set, about 20-25 minutes. Remove from oven and let the muffins cool for a few minutes before serving.